My childhood neighbor, Arzetta Poole, instilled in me a love of quilting and fabrics. She had piles of brightly colored feedsacks and vintage novelty scraps mounded in her sewing room. But she also had a small box of treasured pieces she said were too old to use. I remember peering into the box and seeing tiny little pieces of white fabrics with animals and bugs doing strange things like playing baseball or catching fish. I was mesmerized and I have loved these special conversational (c1890) prints ever since. So here is my August mini with 60 different reproduction conversational prints. I was going to call it "Just Making Conversation", but I think "Small Talk" seems more appropriate for its size (16" x 20"). My favorite fabric is the cricket playing pool! I was going to use a soft Cadet blue as an alternate color, but my May mini was blue and white so I chose my favorite Mary Koval red print instead. I used a bamboo batting (from Busy Thimble) for the first time as an experiment. It has much the same feeling as Warm and Natural cotton which is really a bit heavy for such a small quilt, but I like how it came out anyway. I really wanted to hand quilt it, but… well, you know! Kyle's (Timeless Reflections) August mini is gorgeous and really picks up the colors of summer (here). Barbara's (Quilts, Gravestones and Elusive Ancestors) August mini is perfect for this summer month (here). Barb (Fun With Barb) has been working on a fabulous summer spread and made this little adorable mini to match (here). Barb and I have worked independently on similar things more than once - spooky or just kismet?! All I can say about Janet's (Rogue Quilter) is wow! She has done it again with her mini magic! And Randy's (Barrister's Block) touch of wool is magnificent! What talented quilters we have! Noah and Matilda sew-a-long update. This is one my favorite blocks so far! I just love this design. I contemplated using the yellow (my favorite color) in the center circle, but thought it looked better with the neon there. The antique neon in this one came from a dear friend and is perfect for this block. It has been used enough so that it is now colorfast. Many of the antique neons are not and I have to be careful not to use any that will “bleed” onto the shirtings. I like the repro on the back as well. I have started to work on my alternate blocks and border pieces. I will post when I get a better handle on how they will work with the rest of the quilt. I am beginning to see the light at the end of the tunnel. I should be done before Christmas! I am packing up some vintage quilt “stuff” for the annual American Quilt Study Group annual auction. 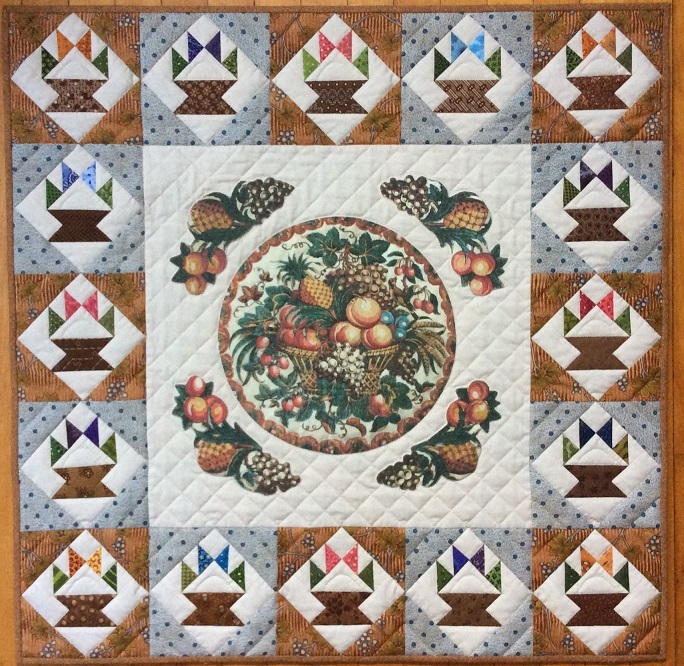 I was going to donate my Moda Blockheads quilt, but I think “Cecile’s Fruit Cake” is a better choice for an organization devoted to quilt history. Cecile (PatchworkInspirations) hosted a fun sew-a-long where we were all to make 16 basket blocks of our choice. I chose the “cake stand” block because it is easy and it is one of my favorites. The center panel is printed by Kay and Lori Lee Triplett and you can find it in 3 sizes (here). I cut the panel apart and needle turned the center onto the background and used a simple blanket stitch (broderie perse) on the corner pieces. 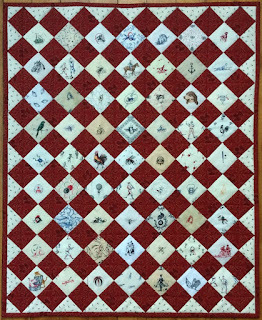 I hand quilted most of it, but added a bit of machine quilting in the ditch in the border. I had an absolute blast at last year’s seminar in Manchester, NH. I hadn’t been to one in a while so it was great to reconnect with friends and to meet new members. 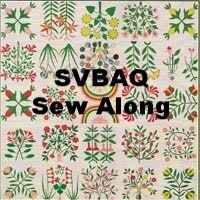 If you are at all interested in quilt related history, I highly recommend you join AQSG. It is such a great organization! April mini - By George! No, you didn’t misread the title. I was taking inventory of my monthly minis and realized that because I cheated by counting my (Humble Quilts) doll quilt swap as my April mini, I would only have 11 quilts to show for at the end of the year. Since I have had such a leisurely summer (stop laughing), I thought I would make two in August. After all, April and August both start with “A” so it was the logical thing to do. By now you have realized that this summer’s heat wave has gone to my head. Last week I received a lovely package from the very generous friend. 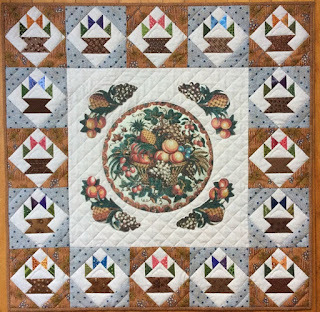 I have followed all of Barbara’s blogs over the years, but her new blog (Chintz Panels in Quilts) is making me crazy! I want someone to reproduce every panel she posts. They are to die for! In the squishy package were two gorgeous reproduction chintz panels (more on those later) and this little medallion of “George”. It was the perfect item needed to fill my April obligation. 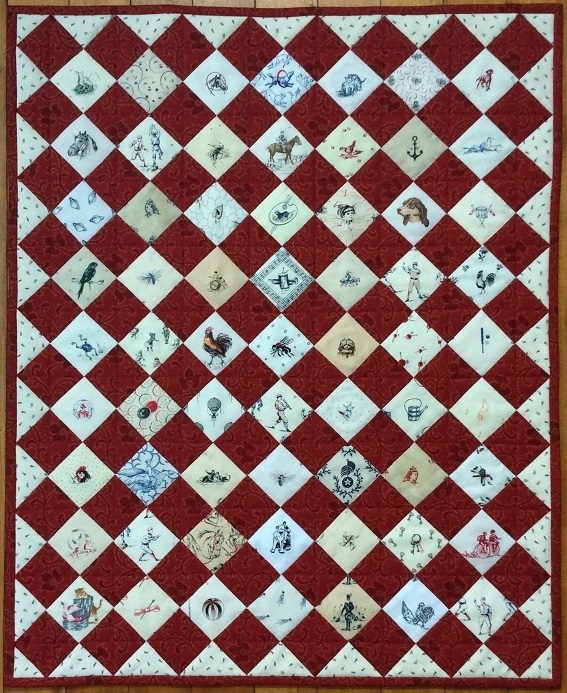 I love medallion quilts and I figured George needed to be the center of attention so, I gathered a few early (pre 1840) reproduction scraps and “By George” was born! Thanks Barbara! 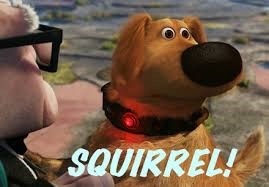 I am so overrun with scraps right now that I decided to join the “Squirrel Club” (see the button on my sidebar). Visit Julie’s (Quilt Diva) blog post (here) to see what it’s all about. I promised myself I wouldn’t join one more thing this summer, but this one has NO rules and NO deadlines. How can you go wrong? Take a look and join in the fun! I know the entire country is experiencing unusual heat so I really can’t shouldn't complain, but… we are just not used to this kind of weather in Maine. I live in a 150 year old house which normally stays relatively cool when we close it up. NOT this summer! I rarely say it is too hot to quilt, but this stuff gives new meaning to “quilt ‘til you wilt”! I have managed to finish a few more Noah and Matilda blocks (in the wee hours of the morning with a window air conditioner going full blast). I love the antique neon I used for the basket on this one. And, the neon reproduction I used for the flower is one of all time favorites. It’s from a Kay England collection and I surely wish they would reprint it! I love this block as well. 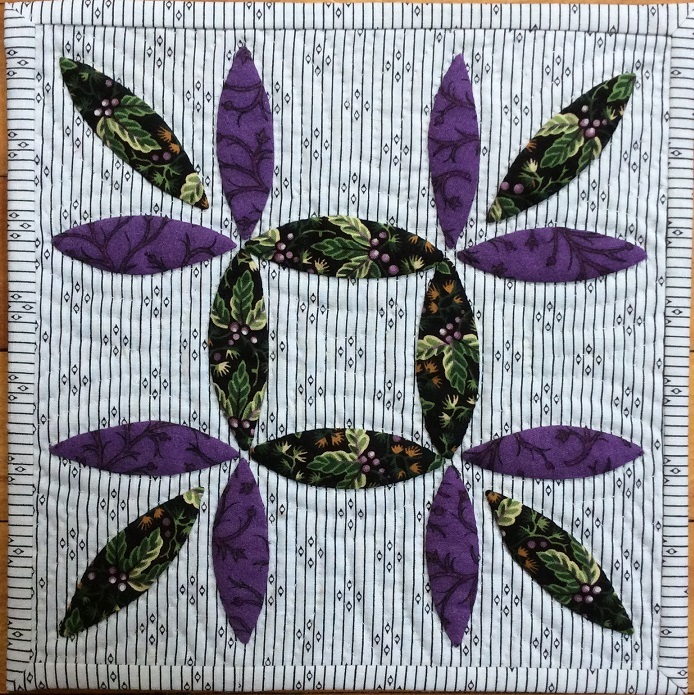 For some reason it is very relaxing to applique symmetrical designs. Funny, because I consider myself a very asymmetrical person! 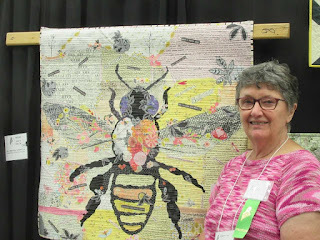 And, Cyndi (Busy Thimble) sent me this photo of our friend Ann and her wonderful bee quilt. Ann is just as sweet as her quilt! Hope you can all stay cool and get some quilting time! 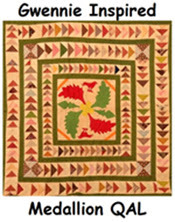 The New England Quilt Museum had a wonderful display of quilts from the family. I had such a good time talking with Laura Lane and Pam Weeks, that I neglected to take photos! Luckily Cyndi (Busy Thimble) took some fantastic photos and has wonderful descriptions on her post (here). My favorite part of this year’s show was the Quilter’s Alliance’s “Go Tell it at the Quilt Show”. I assisted Amy Milne while she filmed a few chosen quilters and their stories. I was moved to tears by more than one participant. My friend Ann Hussey was one of them. I have known Ann for nearly 30 years, but I learned more about her in 3 minutes than I had ever known before. Unfortunately, the photos I took of Ann did not come out and I didn't notice until I got home! I did however manage to get a photo of her entry into the "bee" challenge. Hers was my favorite. My friend Nena Cunningham brought a quilt she had made with a group to celebrate women’s right to vote. I was in tears as she explained the importance of the support we all get by quilting sharing in a group atmosphere. She discussed the efforts of the Suffragettes and how much we, as modern day women owe them. No one noticed when she went over her 3 minute time allotment! Virginia Morrell is one of our founding members. She brought a quilt she had made as a healing process after the Deepwater Horizon oil rig disaster in April of 2010. Virginia’s attention to detail and workmanship are always amazing. Her story was very moving. 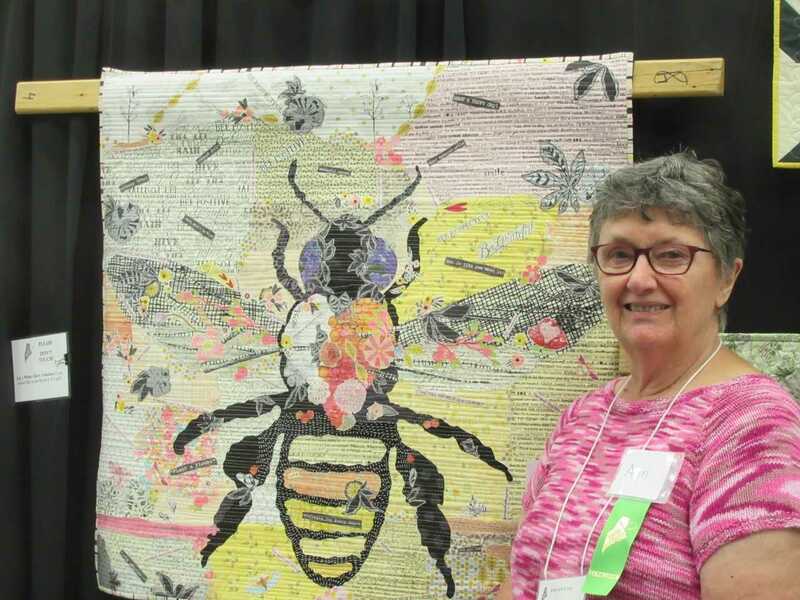 Trudy Wollston brought a little quilt she had made while living in Portugal. This is a logo used in a beverage company in Portugal and Trudy made hers with yo yos instead of bottle caps. Fantastic! I loved it. These are just a few of the quilter’s interviewed and they should all be up on the website in a few months. I will post a link when I find out when they are published. 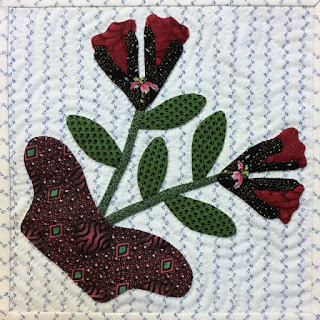 I gave an interview for “Save our Stories” on the Quilt Index years ago so I really wanted to help with this project. It was such a great experience for me. I was very fortunate to finally meet Christine Wickert. I have admired her work for years and my friend Gladi introduced me to this very talented quilter. She is just as lovely as her quilts. She won a blue ribbon, "Best Use of Color", Best Hand Quilting" and "Best Use of Embellishments" It is spectacular! It is all silk. And in closing, this was my friend Kathy's bee entry. She calls it "Buzz Words".